Since I need to eat at least three times a day, the grocery store is one of those unavoidable parts of life. And like other activities that I tend to do over and over again, when I’m there, I default to autopilot–idly shoving familiar things into my cart while I think about something else. Well, it’s time I wake up. It’s a new year and the desire to slim down and maybe save some money while doing it just might be enough to snap me back into coherence while I’m shopping for food. Below are 5 common pitfalls that can hinder weight loss or cause you to spend more at the grocery store, and I offer ways to avoid them. It’s easy to fall into the trap of going to the store every day shopping for only what you need in the next 24 hours. I’m guilty of this because the store is less than a mile from my house. But it’s a huge waste of time and it opens up the unwanted opportunity to “cheat” by letting a bag of chips or a pint of ice cream sneak into my cart. So I’m going to do a better job of planning ahead. I’m going to plan my meals for an entire week so I only have to go to the store once. And on some nights, I’m going to make extra or choose recipes that serve more than 4 so I can take advantage of having leftovers. Leftovers make great lunches and quick and easy dinners too. That way I’m not paying for food I don’t need and I’m avoiding the temptation to possibly eat something unhealthy but convenient, like takeout. Making a list is crucial to a successful trip to the grocery store. Using one lets you think about what you need or don’t need–and helps guide you out of autopilot. Without a list, it’s easy to add things to your cart that you don’t really need (which can be costly) or leave off things that you do. 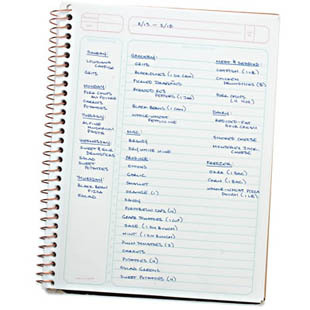 When you’re making a list, divide your ingredients into sections (produce, dairy, etc.) as they would be presented in the grocery store. Not only will you be a more efficient shopper, but you can avoid temptation by not passing the chips and soda aisle a hundred times during your quest to eat healthfully. Everything looks delicious when you’re hungry, making it that much harder to avoid calorie–rich convenience foods. Squash temptation by not going to the store hungry. Plan your trip after breakfast or lunch when you’re feeling full so you’re not battling with temptation the whole time. You’ll end up making wiser choices and not loading up your cart with “extras” that will cost you more money and calories. Some people are willing to spend endless time looking for a bargain. For them that might mean hitting up several stores for the lowest prices. I don’t like to be bothered with that, but there are a few points to keep in mind when shopping for healthy foods–especially fruits and vegetables. Avoid choosing out-of-season produce like fresh strawberries in January, because that’s when you’ll pay big bucks for them (not to mention that they won’t taste like much). Instead, in the dead of winter opt for cauliflower or chard. Keep up to date about the fruits and vegetables that are best to buy organic–and the ones that are not–so you can spend your money on the ones that count and save on the ones that don’t. Ever notice that the produce, meat and dairy are usually located on the outside edges of the supermarket, while the processed foods are tucked in the middle? Avoid unhealthy foods by sticking to the outside edges of the store for the bulk of your shopping. If it’s not in the periphery, you probably don’t need it–with the exception of a few things like whole–grain pasta or brown rice. Memorize which aisle “exceptions” like these are located in so you can go right to them instead of walking past temptations in search of them.